This crazy, wonderful world of blogging can be both crowded and lonely at the same time. I love it, but blogging comes with its challenges! Here’s a glimpse behind the scenes at what it’s like to be a work-at-home mom blogger. This is the 1st post in a 3-part series on blogging. Read part 2, “How to Grow a Blog: Resources & Why Slow and Steady Wins” here and part 3, “How I Make a Full-Time Income Blogging,” here. I’m back, y’all! And let me tell you: I missed you. I really missed you. I’m just ending a 6-week sabbatical of sorts. It was a much-needed respite. As I embark on what will soon be my 4th year of blogging, I’ve decided to take several posts this week to write a little more about what it’s like to be a blogger, what I believe the best method of blogging growth to be, and, finally, how exactly I make an income blogging. 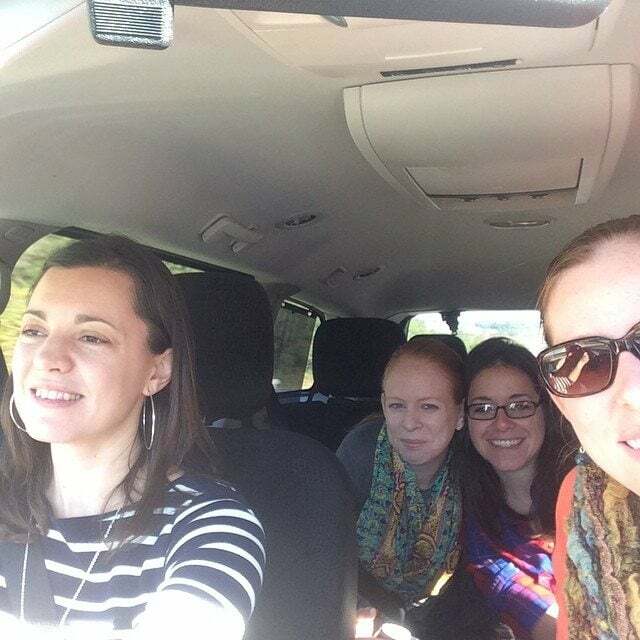 Riding home from the Allume blogging conference with some of my best blog buddies! Response #1 is usually a puzzled look or a look of disbelief. Response #2 is that people want to “pick my brain” (until it hurts! ), so that I can teach them everything I know about making an income blogging, so they can, in turn, make an income too. There is nothing wrong with wanting to make an income with your blog. But I admit that response #2 bothers me almost as much (and maybe even more?) than response #1. I didn’t just go out and “pick someone’s brain” to making a full-time income blogging. I spent hours learning the ropes myself, and my time is so limited because I run this site (and manage my home! ), that I simply do not have the time to teach everyone who asks me how to run a blog that makes money. As well? It is a turn-off to me personally when someone seems like all they care about is the income potential. I see writing and connecting with you as a gift. This blog is first and foremost a community. If I just did it for the money, I would have given up a long, long time ago, and doing anything just for the money would make me want to shrivel up and die! Nonetheless, since I’m asked about this regularly, I hope you will enjoy and be informed through this week’s posts. 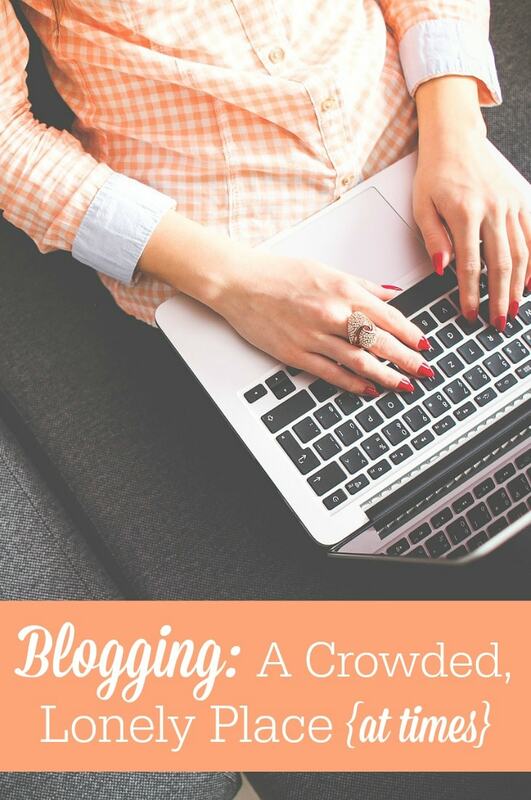 Blogging can be a crowded yet lonely place. Very few of my “real-life” friends understand it. I’m not a work-outside-the-home mom, yet I’m not quite fully a stay-at-home mom now either. When other stay-at-home moms want to go on a playdate last minute, I usually have to say no. I have to plan out my time very carefully to be able to balance this crazy, blogging, work-at-home mom life that I love. As well, when you get hundreds (literally!) of women together in any community, there will arise female cattiness. I don’t think I have ever seen so much drama until I entered the blogger community. Even among Christian bloggers, I have seen my fair-share of jealousy, discord and hurt feelings. I am incredibly blessed, though, to have formed super strong bonds with other bloggers who I see as close friends. I am in a mastermind group with several of these, and we communicate nearly daily via Facebook and/or the Voxer app on our phones. And a couple weeks ago, I had the HUGE blessing of spending several days with real, live women who actually get this blogging life. Spending time with Crystal from Money Saving Mom, Stephanie from Keeper of the Home and Entre Family (and my former Ultimate-Bundles partner), Beth from Red and Honey, Diana from My Humble Kitchen, Kelly from The Nourishing Home and many others like them was like a balm to my soul. We shared soul-baring conversation and deep belly laughs. And it was absolutely wonderful. 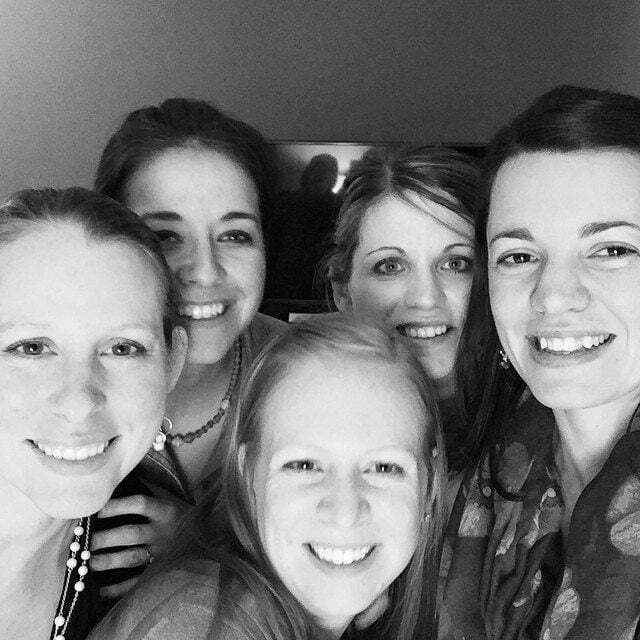 These ladies are, in part, why I keep on blogging when others are quitting left and right. And you readers are another part of that equation. But most of all, I continue to blog because it helps provide for my family and it’s a calling that God has placed on my life. I look forward to sharing a little bit more about running a blog with you all later this week! Do you blog? What is your blog? Share the URL in the comments of this post, so our community can get to know each other! Hi! I’m Kimber, and I’m a writer. (I love saying that.) 🙂 A few months ago, friend encouraged me to begin writing. I love looking for little opportunities to serve and to make the world a better place, so I began a website called Let’s Do Some Good Today. I try to share inspiring stories and tips for service. And every Thursday I issue a new service challenge! I passionately believe that we ALL have something to give to the world, but it can be easy to forget as we caught up in our daily lives. My hope is to help us all remember. 🙂 Thanks so much for the opportunity to introduce myself! While my blog is more of a family “scrapbook” kind of thing, I still believe I’m part of the blogging community. I love writing about our family and how God blessed us through adoption. And I ABSOLUTELY love sharing that with others. Love your blog!! Oops! Forgot my blog address. Lol! Hi, I’m Veronica! I recently re-launched my blog at http://www.anupstreamlife.com. My blog shares information on Biblical truths, nutrition, homeschooling, allergen-free recipes, homemaking, and family wellness. I’m three months in, and although I really feel led to share through my blog, I do have to say that it is often challenging and lonely to always wonder what others are thinking. I’m praying for direction as I continue this journey in hopes that it becomes an inspiration for others. I IS a lonely place at times, isn’t it? Thank goodness there are so many wonderful blogging communities online where we can go if we need to connect. I have been blogging for almost 2 years – it is so wonderful for me to be able to combine my passions for writing and technology into one profession! 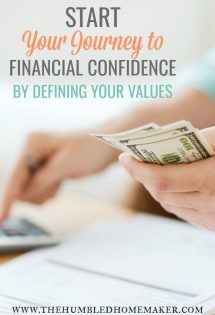 I am blessed to be a contributor here as well as writing on my own blog, Early Bird Mom where I write about keeping the family organized and intentional. Thanks for all that you do, Erin! Your heart truly shines on this blog. Looking forward to reading your thoughts on blogging. I understand what you mean about organizing your time. If we didn’t, nothing would get done (or at least nothing would get done well.) It’s not easy, and there’s a lot of sacrifice that goes into working from home. I blog about being married to and raising a family with a chef – http://EmulsifiedFamily.com. I am fairly new to the blogging world. I have learned, and continue to learn so much from several bloggers (you included!) that I felt this dynamic was something I wanted to be a part of. I love DIY projects, and never seem to make the exact same meal twice, so I expected to have a good bit to share with the world. So far I think I’m only sharing with a couple family members and a few friends though haha! I would love to be able to earn a little money on the side if possible, but I don’t expect anything like that to happen overnight. I definitely appreciate pointers though! Sweet friend, you are such a blessing that I thank God for each day. It was such a JOY and blessing to spend time with you in your beautiful home and at Allume last month. It truly renewed my heart and spirit to keep on course with God’s plan for my life and keep my heart in tune with His whether I’m blogging, homemaking, loving my family and friends or ministering to others – I want to do it all for His glory. And so having likeminded sister-friends like you to spur me on is beyond a blessing and treasure! I love your blog and it seems like a reflection of YOU, you are an inspiration to me. Your blog always seems to show a lot of grace. My favorite thing about blogging is meeting other people interested in natural living and creating commaderie that I do not have in real life. I have to admit, I would probably be the second type of person you talk to about blogging! I love writing and see blogging as a way of ensuring that I actually do write and I hope that one day I can turn what I enjoy doing into a way to supplement our family’s income, which is why I would want to pick your brain. So I’m glad you’re sharing here! I’m a contributor and Red + Honey and I loved seeing Beth’s Instagram pics from Allume! You all did have a lot of fun. The relationships born out of blogging are pretty fantastic. Thank you so much for sharing your experience, inspiring. I will be restarting this month, after a spending a month from blogging. I am not new to blogging, but my inconsistency keeps me from moving forward ( truth moment, yeep!). Its hard to keep going without support, but anywho…I decided I will keep going. One of my first steps in forward is to start a mastermind group this month! My blog is http://www.embracingthecall.com which primarily focuses on my journey of faith, family, health and home, with the hopes of encouraging other women. I’m looking forward to this series! 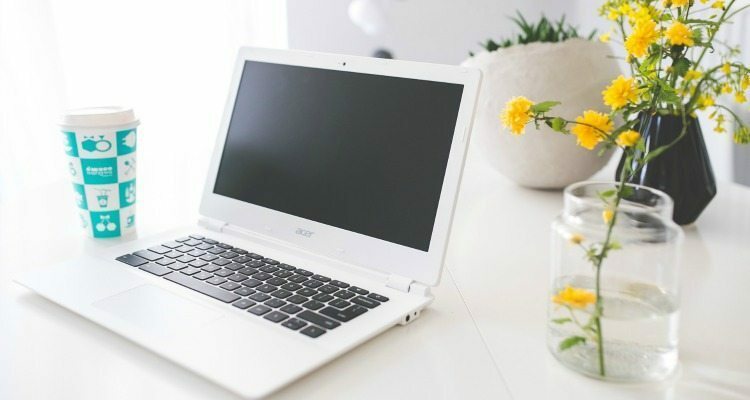 I love learning more about blogging and while I’m not sure I would put in the effort it takes to blog for a full-time income, I am excited to learn how to take my blog to the next level. Hi, I’m London. My friend and I just recently started blogging at http://www.makingnaturalthenorm.com where we want to blog about living a more natural lifestyle from what we eat, what we use as medicine, to what we allow in our homes. We are doing it more as a hobby and want to share with each other what we learn as we study more about living a more natural lifestyle. I follow you on pinterest and enjoy what you have to say and am learning a lot from you. Thank you! London is the coolest name ever! Just had to comment. I love the city of London, and have considered that as a name for a child multiple times! Maybe it will still happen?! I blog at http://www.ourlifeouthere.com where I share my journey as a homeschooling, homesteading mom and use my experiences to encourage others. I am not a blogger but I enjoy writing and journaling. I have found it quite therapeutic and healing during difficult seasons of my life. As of late, I am feeling like God is challenging me to get out of my comfort zone and do more with it but I am not quite sure what. I am beginning to pray about this and look forward to reading whatever advice you have on the subject. Thanks in advance! Love this post, Erin, and can’t wait to read the rest. Thanks for sharing your story and your heart! My blog is http://www.fromthiskitchentable.com/ – choosing to live – simply and healthily on a budget blogging under the categories of Food, Finances, Family and Home. I’ve kept a personal blog for years, for my family and friends, but just earlier this week, I started a new blog about my homeschool journey (which began at the beginning of 2014). http://biculturalhomeschool.blogspot.com . I debated whether to start this one, and I don’t plan on making money from it, but hope it’ll be an outlet for me to talk about my journey (since most of my circle of ‘in person’ friends/family are not homeschoolers) and maybe be an encouragement to others. I’ve found that even though barely anyone reads my personal blog, it is therapeutic, allowing me to slow down and reflect on what’s been going on in my life, and it’s a great memory journal of our family, something to look back upon to remember some of my thoughts and feelings at different stages of our lives. I love your blog, and I’ve found so much great inspiration and practical advice here! Hello! I’m Virginia Knowles. I have several blogs, but my motherhood and homemaking one is at http://www.ThisMomGrowsUp.blogspot.com. I’m the mom of seven daughters and three sons, and grandma to four little boys. This year I am home schooling only my youngest, a nine year old girl. Thanks for this post Erin – breaks are good things to do! I have to admit, creating online “blogging” relationships is one of the hardest things for me to do. It seems to be the place that I need to work on the most and I love hearing about the great ones you’ve created. I’m super excited for the rest of your series! I blog over on Oakland Avenue, http://www.oaklandavenueblog.com – it’s all about motherhood – the great, the gross, the grace and everything in between. Hello sweet sisters!!! I started blogging a few months ago and have written a total of three posts. What a time committment!!! I am a mommy to six wonderful kiddos and I started blogging because I noticed my Facebook posts were getting a little … long. The blog for me is mostly a diary of sorts so I can keep track of what happens all day while I stay home with my three youngest; did I mention I have a three year old and two year old twins who are 11 months apart??? Anyway, the triplet adventures (as I like to call it) range from entertaining to downright trying but through it all I try to maintain my sanity through writing and a gracious sense of humor. I hope to learn more about blogging so that I can take what I have learned as a mommy and translate it into real world practice. I look forward to this series in a BIG way!!! Bless!!!!! Hey Elizabeth! I can totally relate! Facebook was becoming such a fun and intuitive thing for me, I decided to put the time into blogging instead. I would love to connect with you! I will pop over and check out your site as soon as possible! Of course I forgot to post the site!! It’s http://www.sixpackparenting.com. Please come for a visit???? Glad that you are back and you seem to be rejuvenated. I recently started thrfamilyfinder.net. I quit my job to become stay at home mom. So many of the women I worked with are heart sick when they have to leave their babies/ kids and the overwhelming respond was “I wish I could stay home too!” So I started the family finder to hopefully let everyone know that it can be done. Even when on paper it looks scary. hey! thanks for this series! I’ve been following you for a while now around working fulltime and being a new mama to a little baby boy. my blog is http://dysfunctionally-functional.blogspot.com – I don’t blog anywhere near as often since I had the little guy, but I mostly focus on scrapbooking, art journaling, mixed media, organizing, home décor, and the little guy, ofcourse. I love you blog and your willingness to share all you have learned in getting it started! Thank you! I think this series is just wonderful, Erin, because I have the same heart that you do. I believe that my writing is a gift from God and I want to honor Him first and foremost with my blog. Secondly, I want to encourage others in faith and frugality. We have hit hard times, yet we continue to thrive. I want to encourage others to see things the same way rather than become discouraged. That being said, my family could certainly use some much needed income. As I look for ways to do that, I tread carefully as I do not wish to have a money-drive, but a heart-driven blog. As you have the same heart, I consider it a blessing that you are sharing this with us. Thank you, again, for featuring me as a Guest Post while you were on your sabbatical. We missed you and are happy to have you back, but glad you enjoyed your rest. You can find me at http://myoverflowingcup.com/. Thanks! Thank you so much for sharing! I am looking forward to reading the other two posts in the series. I am new to blogging. I created http://www.thehealthyfitfoodie.com as a way to share my journey from being an over weight kid and teen, to underweight disordered eating young twenty something to finally finding my niche and being healthy in my late twenties. I share healthy recipes and fun ways to stay active as well as my struggles and successes in life. I’m hoping to inspire others and help others get healthy in the process. I someday hope to make this my full-time “job” to help others on a much larger scale. My husband and I blog together at http://www.runningwithteamhogan.com about running the race God has set before us. We’ve a homeschool family of 6 with our 4 children only 4 years apart total (and the oldest adopted). We aren’t necessarily looking to make it a full-time income, but enjoy doing it together as an extra income source for our family. We share book reviews and library finds (from me), science experiments and game reviews (my husband), and lots of lifestyle of learning ideas from both of us. We hope to have our children join us in blogging eventually as well. Thank you for these blogging posts. I enjoy learning from others (but won’t pick your brain about it 🙂 ). Hi Erin, I loved this! I decided to start a blog helping other women who WANT to stay at home but feel like they can’t afford the “luxury” of not having two incomes. I want to write to help and empower women, but the writing does take time and a lot of emotional energy I wrote a book on the topic several years ago and I’ve been researching and contemplating blogging ever since. I FINALLY forced myself to start learning about the blogging world and boy is there a huge learning curve! My blog started about a week ago and it’s rough going. I admire all of you women bloggers out there, I’m having a hard time getting up and running and finding the time. It’s especially hard because I’m homeschooling as well so I totally understand guarding your time. I love your blog, keep up the good work, you are appreciated!! Sherri– Your focus sounds right up my alley! I SO AGREE THAT IT IS SO HARD TO CARVE OUT THE TIME! I, too, want to encourage moms who want to stay home. And I homeschool as well. I recently started a blogging mastermind group (we meet via google hangouts once a week and have a private facebook group. )If you think you would appreciate the community (it is a pretty small group), do email me! I am nowhere near as far along as Erin, but she and all the other wonderful mom bloggers out there really inspire me and I’ve learned SO much already. Blessings on your journey! Hello! I am very new to blogging and just got my blog started. My website http://www.anorderlyhousehold.com will be linked to my blog anorderlyhousehold.wordpress.com soon (once I learn how). I have been feeling led by God to get this started…now is the time! I believe He wants me to start with a devotional designed to draw us closer to Him. He started giving me the structure for a 49 day devotional a couple of years ago, but I didn’t know what direction He would lead me in (or what the timing would be) back then. It’s very exciting and nerve wracking all at the same time. So many unknowns – so much to learn! We’ll see what He has me add to that in the future. I have been blessed with strong organizational skills in the workplace that I’ve been translating into organizing our home. We recently made a big move from Michigan to Tennessee to be closer to our youngest daughter and her family when my husband partially retired. He and I are both interested in being prepared for disasters and I’m also cutting out the use of as many harmful chemicals in our home as I can. Both of those are large projects that I would love to help others do by sharing our experiences and the experiences of others as well. Thank you so much for this opportunity to connect with all ya’ll! Thank you for this post! It is great to also see all these other new blogs to read! I have been blogging since 2010, but have recently started a new blog with a new focus. http://www.littlebluechalet.blogspot.com is my adventures in marriage, motherhood, and faith. It has been a blessing to start to write about things close to my heart in faith. Very excited for this calling! I know what mean with the #1 response. Although I have yet to make money, they still look at me like that when I tell them I blog. I love the connection with readers! Just found your blog through a link posted by Crystal from Money Saving Mom today. I’m looking forward to having a look around your blog and appreciate you taking the time to write this series of posts. I began blogging in February. I have so much to learn but I am really enjoying it thus far. I blog over at Mary Martha Mama . I can relate to your “not-a-stay-at-home mom and not a go-to-work-mom” dilemma. I’ve been in that position for the last 34 years, ever since our first son was born. Very few of my friends and neighbors could understand. Yet, it is the best–and worst–of both worlds! I’m blessed to have made it work. Being a writer has been a great career choice. Obviously I didn’t have a blog when I first began, but I have for several years now….http://www.MoneyGodmotherBlog.com on WordPress. I caught a post linked to Money Saving Mom and clicked over to your site. Kudos…and keep it up! I’ve enjoyed reading your blogging series! There is so much to learn but I take comfort in the slow and steady approach! 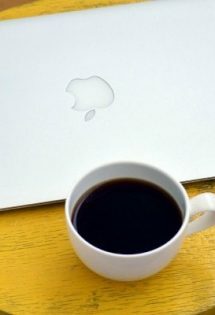 I blog about life, finances, and the choices we make over at http://www.howdothejonesdoit.com. I look forward to following you and checking out some of the other bloggers here as well! I just began blogging. It seems I always have something I want to talk about and I don’t have many real life riends to call up and chat so I write it down. I thought blogging would be a good way to get my thoughts out there and see if anyone shares my opinions. Of course, once I started posting them to the website, my mind drew a blank. I began thinking of what I should say that would be interesting. I decided that it didn’t matter. The point was to express myself and so I have slowly been adding posts here and there when the mood strikes me but it has not become anything big and I have never advertised it. Not even to family and friends yet. Maybe you could check it out and let me know what you think? I always enjoy others’ blogs but, I am not sure if I have what it takes for people to want to read mine. It would be nice to have some outside opinions. Thanks! Hi! I’m Holly and I blog. Well, I used to blog. I THINK of blog topics all the time. I just don’t sit down and actually compose them. When I read back through my site, I’m floored at some of the things I’ve done and said and even created. Is that person really me? I want to be more like her every day. I just committed to NaNoWriMo and am half-way to my goal. This has proven to me that if I can write a WHOLE book in a month, I can certainly blog. I have the time. I just have to USE the time. I’m hoping to make some great connections here and garner encouragement. We could all use a little more of both…right? Hey Holly! send me a message over on http://www.thesmilingfamily.com. I am just starting out and am interested in connecting with other bloggers as well! Erin, I hope you don’t mind me leaving so many comments here! Thank you SO much for being a facilitator!!! Thanks for the information, I recently started a blog and I am working to develop it slowly but to have an impact. Your information will definitely assist me in making my blog more applicable and accessible to my potential readers. Excited about this series, heading to pick up my little one from school and then I’ll move on to parts 2 and 3. Thank you for sharing. Hi there, thank you for this post. It’s really encouraging for a newbie blogger like me to see. I’m pregnant with my third child and have just started my blog http://www.babytoddlerme.com, and I definitely admit that it is quite a lonely world, and most of my friend’s don’t understand it. It’s great to have found your site. Thanks for sharing the things you’ve learned with us! This has been very inspirational to me. God had put on my heart almost 2 years ago when we moved to our new home. I know the moment we walked the property that God was present and calling me to “Peace”. Since that day I have been trying to understand how God wants me to use what he is speaking in and through me. Recently he had mentioned blogging seeing I am always reading others to inspire me to write about how God is working through me in my everyday life. I had started a blog shalomwoodedacres.blogspot.com to share things with friends, but I am seeing God lead me to something more. Thank you all of you who allow God to speak through you to minister to others. thank you so much, Cheyenne! I hope you love blogging!! I find it interesting that you are irritated by people asking questions about your blogging and how you make an income. I only know one or two people who blog and no one who makes any income off it, but I admit I’d certainly like to pick someone’s brain over this. I’m afraid to start! I love to write and think I’m talented at it, but the idea of trying to blog is scary to me. Having said that, I am interested in all facets of blogging and not just how to make money. Congrats on your blog, and I am so glad you’ve found these resources helpful! I just recently entered the world of blogging. I’m not sure where I want to go with it yet but I’m so happy to read your tips as I’ve been following you on Facebook for a while now! Thank you so much for sharing your insights! Thanks for the intro., Cassandra, and welcome to blogging! I love your blog. My blog “the house on crazy street” is about my life in a very dysfunctional home and how I have survived. My prayer is that others who have lived this life can learn to retrain their brains and survive this life without passing their craziness on to their own families. Thank you, Kathy! Sounds like a neat blog you have! Hello! A friend of mine introduced me to your blog, and I have loved reading several of your posts. My name is Jayni, and and writing is a passion of mine. My husband encouraged me for a long time to start a blog, but I could never figure out what kind of blog to create. However, after I started losing some weight, I found another passion: health and fitness. I love being creative, cooking (minus doing dishes), and inspiring other people. 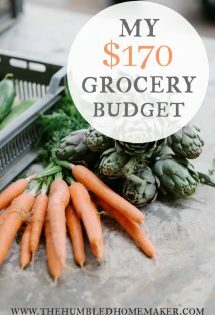 I was able to lose weight and start being healthy on a one-income budget while my husband is still going to school and I take care of our two little ones. I figured if I could do it, anybody could! And that’s how Fit and Lively Mom came about. I write to help inspire others to not just be healthy, but also be happy! Congrats on starting your blog, Jayni!! It sounds like a great encouragement for moms wanting to get fit and healthy! Erin!! This post has been SO HUGE in changing my entire mindset about blogging. When I found this post a few months ago, I started listening to the podcasts you recommended, and I CAN’T GET ENOUGH! I started implementing so many of the things I was learning–gosh, it’s a free education, it’s amazing! And have been having so much fun. I even found a couple of people (one from the comments here!) to start a mastermind group with, and that’s been awesome. Thank you SO much for sharing this stuff in public and not being elitist about what you know. I am so glad that you have the wisdom to write a post for us all who do want to pick your brain about specifics! Yes! maximize your time! I finally got consistent with writing even when I feel uninspired, and even though I can still only do two posts per week, it’s really exciting and fun and I finally feel like I have a handle on HOW to go about growing a blog and what to do. Before, I just felt that I had to be “discovered.” Hahaha! So thanks for your generosity. Amazing. I’m so glad I’m not alone in this, Michelle! Thank you so much for your honesty! I just started a blog about 3 weeks ago and I’ve realized that there is so much more to learn than just how to write!! I read your other two posts of this series and they were very helpful 🙂 My blog is gleaningful.com where I write about art, books, and other artish things. I’m so glad they helped, Bryn! Congrats on starting a blog! I hope you LOVE it!! Thank you, Erin, for this series. I’m really looking forward to finding my own blogging friends. If anyone is interested in connecting, I blog at http://nikkiraeink.com. I hope you are encouraged, Nikki! I just left a comment on your post over on moneysavingmom.com. I followed the trail and found this. Thanks so much for sharing your wisdom and your heart with us. I’m new to the blogging world (a member of EBA) and looking to connect with bloggers too! Just sent you an email with some more resources! Many blessings to you!! I love your blog name! Thanks for sharing your site, Diane! Many blessings to you in your blogging journey and ministry! Hi Christina! Congrats on your site! I think you have some really awesome content. I blogged in secret for the first 6months. It was hard to just put myself out there, but it has paid off and has helped me develop so many friendships. I wish you the best! If you switch over, you have some great content to start with! I was so pleased to find your site in the past few months, follow you on social media and today as I was browsing your site for ideas, I came across this series! I am so so relieved to read what you’ve shared about starting your blog slowly, how the money wasn’t there for all that you wanted to do at first, how making an income wasn’t your first focus. I am RIGHT THERE with you! I launched my blog PracticalFamily.org just this week after 2 YEARS of praying and being led in this direction. I too love to share what I learn and encourage people, and this has been my main motivation since leaving the workforce and staying home with my 2 kids. I’m working with a wonderful husband / wife team who are web developers and business coaches, and most importantly, they love the Lord (SwissCo.us). I will continue to use your site as a resource to glean from and pray for continue direction. Thank you for stepping out in faith and continuing your journey, I hope to gather my own group of blogger beasties very soon. Nice to meet you, Jenn, and thanks so much for sharing your blogging story! I hope you can gather your blogging bffs for a weekend together soon. It’s so much fun! Thanks so much for these helpful articles! I’m a new blogger and am praying God will make His will clear to me on this path. My lawn and garden blog is on my new home business site, Harris Garden Cards. Our venture sells sets of note cards featuring my garden photos with blank space inside. We donate all profits to support missionaries and mission outreaches. When you visit the site, be sure to click on the tabs for Blog and Who We Support. Great ways to support the spread of the gospel of Jesus Christ! I enjoy you so much. I enjoy how you enjoy your family and your life. Thank you for living life like you do and letting us watch and learn. I’m a lit older than you. I’m a farm wife and mother of four grown kids and one grandchild and I love reliving the life of a young mother with you. Although I do have to say this empty nest thing has a lit of good things to offer. I want to encourage you to keep on keepin on.